More than 100 plane passengers brought a new meaning to ‘in-flight turbulence’ last night after staging a mutiny when the captain announced some unscheduled stops. 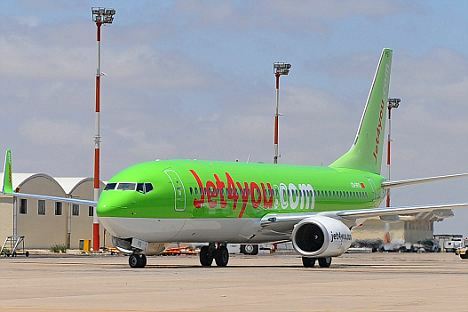 An aircraft operated by Moroccan budget airline Jet4You had been due to make a 90-minute journey from Toulouse, France, to the Moroccan capital Casablanca. But when the captain told the 137 passengers the plane would be stopping at Bordeaux and Lyon en route – adding four hours to the journey – the travellers refused to sit and buckle their seatbelts, leaving the plane stuck on the runway all night. And rather than reason with the paying customers, the captain simply turned off the lights and heating in the jet and left the passengers inside. Mother of two Majette Ouri, aboard the plane, said: ‘It was a total disgrace. We bought tickets for a direct flight taking less than two hours. Everyone decided they could not let this happen and refused to allow the plane to take off. Then at that point they simply turned of the lights and heating and left us there. Passengers, with a lot of children and old people amongst us, were cold and hungry. ‘It is frankly an appalling way to treat paying customers.’…………………..continued.